Oh and did I mention that my friends at BuyGreen are helping me offer this groovy green, sturdy little iPad accessory to you at wholesale pricing? What's not to love? This is solar at its best, making your life easier. It even has a convenient strap for those days when you totally go eco and ride your bike to work or school or to keep your hands free for other pursuits...like mothering. - 8.0 Watts of Solar Panel generate power in sunlight. Panels are waterproof, lightweight and built to withstand abuse. - Charge times: About 10 hours in direct sun will fully charge an iPad, other tablets may take less time. 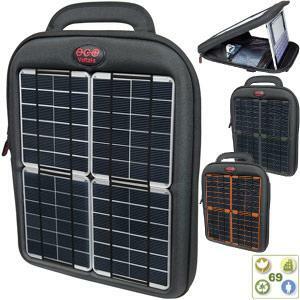 - Universal Battery Pack stores power for use anytime and is specially designed to charge efficiently from solar. When not in the sun, the battery can be charged from normal or high-powered USB ports. - Output: Two output ports, a 5.0V, 600mA via USB port and 5.0V 2A from high-powered USB port. Can charge two devices at the same time. 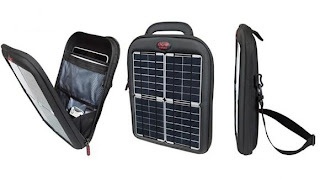 And just in case you are interested in the solar charged backpack chatted up in the video above, I wanted to let you know that one of the things I love most about that particular solar Voltaic onverter backpack is its ergonomic, lightweight design. 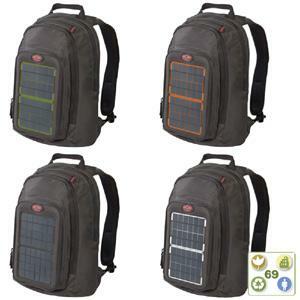 The converter voltaic solar backpack is the perfect bag for commuting and short trips. With 4 Watts of power, it will quickly charge all your hand held electronics and insure you are never without a charge. Plus, the super padded laptop sleeve protects your investment and the roomy front pocket keeps everything secure and within easy reach. - enough room for a laptop and gear for a day trip. - 4 Watts of Solar Power: 1 hour in sun = 3 hours talk time. - Storage: One main compartment with 4 interior pockets, iPod or sunglass pocket, laptop sleeve and front pocket for charging and small electronics. - Wire channels: placed throughout the bag for headphones, water bladder tubes etc.